Anyway, the event may not be super-huge, but it’s still a big deal for my neighborhood and surroundings. Peachtree Street’s main drag is closed to art and food booths. While smaller than the other festivals out, this one is decent and manageable, and of course a big milestone for our area. There’s even a mile run-walk, which I did not partake in but could have. 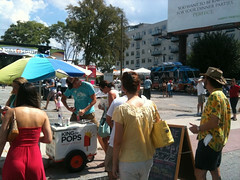 Besides the aforementioned Popsicle royalty, lots of food stands and trucks from local restaurants and food providers. Food trucks are a thing right now, you know, a Thing, and I spotted a Yumbii-mobile out serving Korean/Mexican/Southern fare. Ultimately we decided to try the YEAH! Burger stand just to say that we did. I had the beef, turkey and veggie sliders. The turkey and veggie were far better than the beef, but it was a bit odd to think that (arguably) Atlanta’s best burger joint was just a few yards away. I’m talking about the Vortex, yo. You know it. Word. We had a little mini-JMMF-powwow in north Atlanta the other day and it was really nice. This of course was the day before the Augusta Nationals [EDIT: My slang term for the Masters tourney held at the Augusta National Golf Club], and we had some wonderful conversation…. the food was good, too. The whole evening really made me think. I got involved in all this because back in college, sports was a big issue and I worked for the college paper. Nowadays I’m more distanced from it; however, the recent torch relay protests demonstrated to me that sports is still at the forefront of current discussion.